In partnership with the city of Newark and the University of Delaware, the Newark Bicycle Committee is organizing this year’s Bike to Work Day event to be held from 7:30-10 a.m., Tuesday, May 14, on the Trabant University Center patio. Speakers will be UD President Patrick Harker, Delaware Secretary of Transportation Shailen Bhatt, State Sen. David Sokola, State Rep. Paul Baumbach and Newark Mayor Vance Funk III. Local businesses will be sponsoring the event by providing light breakfast food for participants to enjoy before completing their commutes to work. The Delaware Department of Transportation (DelDOT) will be providing a limited number of free event T-shirts while they last. 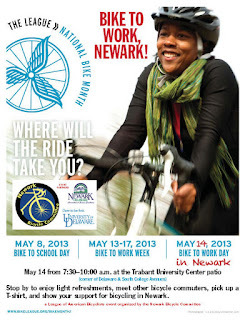 In addition to DelDOT, the Newark Bike Project and WILMAPCO will also be present to help the Newark Bicycle Committee ensure the success of this event as a means of drawing attention to the importance of bicycling as transportation, recreation, and a source of economic development in this community. 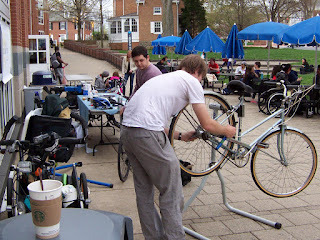 Stop by our table for a bike safety inspection and light tune-up. Visit Wilmapco's website for full event details, including the event program.